Welcome to Hoodles Childcare. Choosing a nursery is an important decision, therefore we hope the following information will answer your questions about our aims and standards of childcare and education to enable you to have complete confidence that you are making the right choice. Hoodles Childcare was established in 2004 and provides quality care and education for children aged 6 weeks to 5 years in a relaxed, caring environment by qualified, experienced nursery staff. 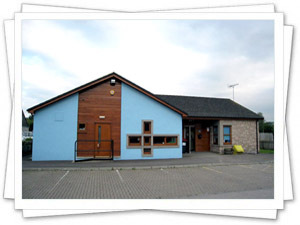 Situated only 21 miles from Aberdeen, Hoodles Childcare, Oldmeldrum (opposite Meldrum Academy) is within easy commuting distance of Dyce and Aberdeen. Hoodles Childcare is registered with careinspectorate.com (Social Care and Social Work Improvement Scotland) who were formerly the Care Commission. Careinspectorate.com is the registration and inspection body for all care services in Scotland. The nursery is inspected regularly by careinspectorate.com (usually unannounced) to ensure the high standards of childcare and education laid down in the National Care Standards are being met. Hoodles Childcare has an extensive number of policies and procedures in place including: Health and Safety, Equal Opportunities, Child Protection, Partnership with Parents, Allergy Procedure, Prevention of Infection, Additional Needs Policy. All our policies and procedures are displayed in the hallway for your information or you can request copies from the Nursery Manager. The principle aim of Hoodles Childcare is to provide the highest possible standards of childcare and education to all pre-school children. To provide a safe, secure, welcoming and happy environment for children from the ages of six weeks to five years. To assist all children attending to attain their maximum potential within their personal capabilities. To recognise the value of parents input and encourage them to share in their children’s learning and the life and work of the nursery. To provide care and quality experiences for children aged 0 to 3 years following the guidance contained in the Pre- Birth to Three Document; Positive Outcomes for Scotland’s Children and Families. To follow the Curriculum for Excellence for children aged 3 to 5 years in order to provide quality activities and experiences to promote each child’s development and learning in all 8 areas of the curriculum and to apply the GIRFEC (Getting it Right for Every Child) approach to enable each child to become a confident individual, an effective contributor, a successful learner and a responsible citizen. To refer to and follow best practice as indicated by the National Care Standards (Early Education and Childcare up to the age of 16); Child at the Centre 2 and the Scottish Social Services Council (SSSC) Codes of Practice. To recognise, support and encourage every child’s right to be Safe, Healthy, Achieving, Nurtured, Respected, Responsible and Included (the SHANARRI well-being indicators). To continually assess the guidance available from all sources and work towards best practice in all areas. To ensure every child’s individual learning needs, gender, race, nationality and culture are recognised. To set boundaries in a way which helps each child develop a sense of the significance of their own behaviour; both in their own environment and for those around them. You, as parents are the prime educators of your child in their earliest years therefore we welcome and encourage parent’s involvement in the nursery.